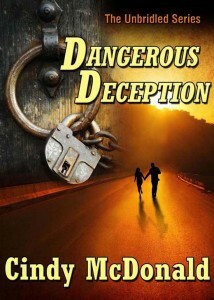 Dangerous Deception was the second cover I created for the Unbridled Series by Cindy McDonald. Ideas come very quick when it comes to learning about a book’s plot from the authors themselves or by simply looking at the synopsis on the back of any book given to me at work. Ideas flowed quickly which made short time on a decision on the concept that would work for this book. Big, bold and dramatic draws the reader to buy and fall in love with the author’s fantastic work. To see the full cover, click the image.